Provide comfort for the family of Rayes Lopez with a meaningful gesture of sympathy. Rayes Lopez, Jr., 57, passed away on Saturday, April 13, 2019 in his home surrounded by his family. Rayes was born on May 20, 1961, in Waco, Texas. 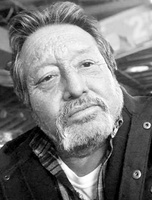 He married Debby Garcia Lopez in 1981, the couple had four children together. He was a loving father and family man. He enjoyed fishing, scrapping, and spending time with his family. He will always be remembered by his smile and joking personality. He was preceded in death by his father, Emmett Gayton; two brothers, Sammy and Danny Gayton; and grandparents, Susie and Pete Gomez. Rayes is survived by his wife, Debby; children, Tiffany and Manuel Palacios, Santana and Carrie Lopez, Alana and Glen Childers, and Ricko Lopez; mother, Lucy Gayton, all of Waco; dad, Rayes Lopez, Sr., of Cedar Hill; 11 grandchildren, and one great- grandchild. Rosary will be recited at 6:00 p.m., with a visitation to follow until 8:00 p.m., Thursday, April 18, at Pecan Grove Funeral Home. Procession will begin at 9:00 a.m., Friday, April 19, at Pecan Grove Funeral Home. Funeral service will be at 10:00 a.m., at New Life Praise Center, 501 E. Loop 340, Bellmead, Texas. A reception will follow at Waco Missions. All are welcome to attend and celebrate Rayes’s Life. We encourage you to share your most beloved memories of Rayes here, so that the family and other loved ones can always see it. You can upload cherished photographs, or share your favorite stories, and can even comment on those shared by others. Provide comfort for the family of Rayes Lopez Jr. by sending flowers.